Hello stamping friend! Welcome to a new challenge with the Paper Craft Crew Design Team. This week we have something new for you – an Inspiration Challenge! Isn’t this gorgeous? Our Paper Craft Crew founder and coordinator, Pam Staples, was visiting a friend, and this is one of the throw pillows that was there! Of course, artist that she is, Pam sees inspiration everywhere, and thought this would be perfect for a challenge. The idea is that you use anything from this pillow to inspire your project for this challenge. It can be the colours, the pattern, the pillow itself – whatever inspires you, dear stamper, to create your project! 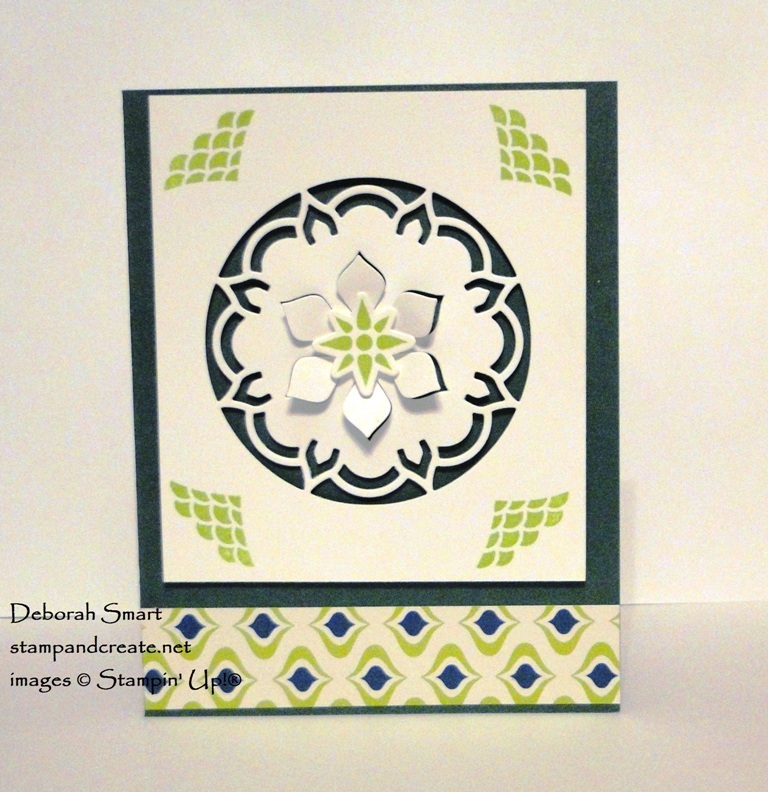 I started with a card base of Tranquil Tide cardstock. Cutting a panel of Whisper White cardstock, I used the Eastern Medallion Thinlits to die cut the middle. 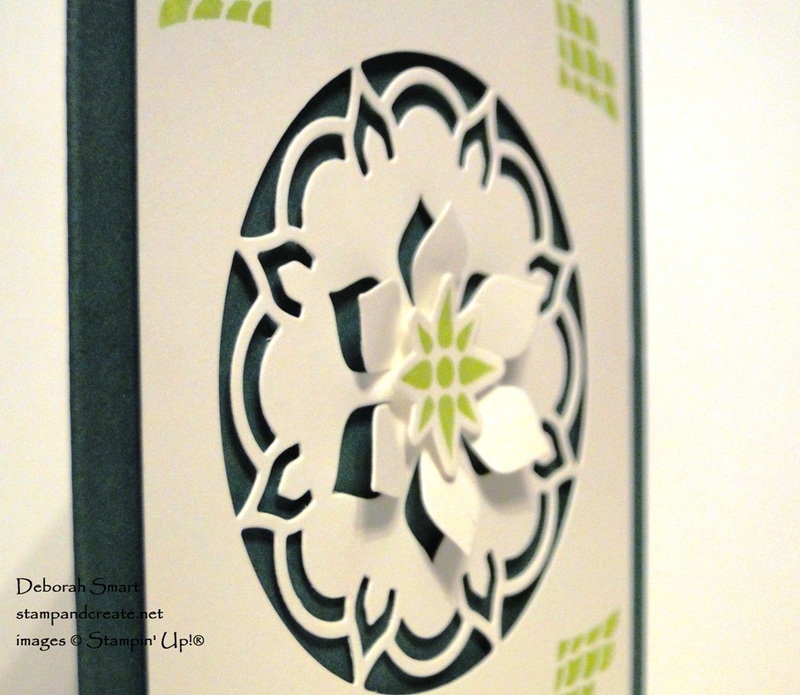 I love how the middle flower like die lifts each of the petals, allowing you to see the cardstock underneath. Using Lemon Lime Twist ink, the details were stamped in each corner of the panel. On a small piece of Whisper White, the middle piece was stamped then die cut again using the Eastern Medallion Thinlits. The 14 piece die set lets you create almost endless combinations and patterns of cuts! Talk about getting ‘the most bang for your buck’ – and you benefit even more by purchasing the Bundle – saving 10% off the combined price of the stamp set and thinlits! After attaching the middle die cut piece with a Stampin’ Dimensionals, I added the panel to the top 3/4 of the card base, using more Dimensionals. A strip of the coordinating Eastern Palace Specialty Designer Series Paper is added across the bottom of the card. This is such an amazing set – I’ve been using it a LOT, and I know I’ll be using a lot more! Order what I used to create this card by clicking on the images below. You’ll be taken directly to my Online Store. Previous Previous post: I’m In Ribbon Heaven! Next Next post: New Embossing Paste!